You are playing a dice game with your friend by rolling two standard dice and recording the sum of the two numbers. You win when two consecutive outcomes are 7. Your friend wins when three consecutive outcomes are in strictly increasing order. You will continue rolling until one of you wins. What is the probability that you will win? And why? Examples: If the outcomes are 10,4,6,6,7,7 you win. If the outcomes are 7,3,7,9 your friend wins. I think Jonathan is pretty darn close, and may even be right. Here's my view though (which gives a slightly different answer). 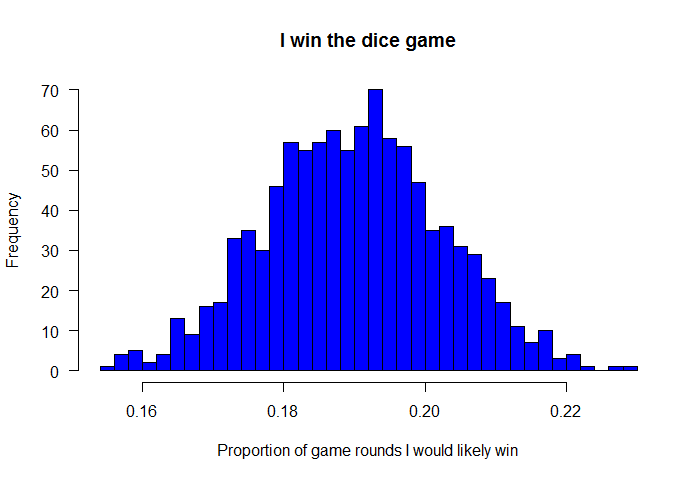 meaning convergence after 256 games, and a probability of 0.1912917. You won 19.07%, 19.15%, 19.14% of the games. That's assuming my (python2.7) code is correct, of course. This isn't intended to be the answer, just posting this for those who want to give it a try. approximately 19.1% of the time. I wasn't in the mood to think so I just coded it instead.